Please join 2nd Planet for our debut appearance at the Impulse Room Jazz Club on Saturday February 17, 2018. 2nd Planet’s performance is from 8:00 PM to 9:30 PM. 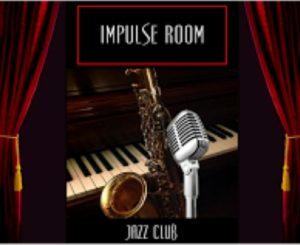 Impulse Room is a 21 and over establishment that is re-defining what the modern jazz club is all about. The venue brings together sounds from eras gone by and combine them with beats that many are unfamiliar with with focus on all forms of jazz and jazz influenced music that roll over into Blues, Latin, Swing, R&B, Progressive, Straight-Ahead, Smooth and more. All of which have a base of jazz. You won’t be bored because Impulse Room mixes it up all the time. This is all brought to you in an intimate setting that puts the performers just feet away from you and at ground level. It’s like hanging out in a big living room. Impulse Room features a cool bar that also serves coffee and teas. Each one is made individually. Like the music, most of our varieties are ones that the majority of people are not that familiar with. And that is Impulse Room, a place of discovery. Seating is first come first serve and there is no holding of seats. This guarantees you a seat for the night regardless of what time you show up. From 5:30 – 7:30 pm there is a complimentary buffet that is included in both the cover and reservations with good food. After 7:30 the food is put away so come early. Impulse Room has a strict dress code so please adhere to it as it will keep you from entering otherwise. Men must wear a collared shirt. You must have a valid I.D. and we check each and every time.